Each box contains 9 decks. Each deck contains 68 cards. 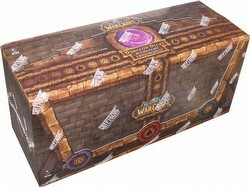 Each 2011 Dungeon Decks box contains 9 decks (3 each of the following Scarlet Monastery Dungeon Deck, Shadowfang Keep Dungeon Deck, and The Deadmines Dungeon Deck). Each deck includes 60 cards, 2 Oversized Hero cards, 6 Character Sheets, and 6 Achievement Cards. There are 3 different decks. Three players take on a Dungeon Deck (no need for a GM - the dungeon runs itself). They are designed to play against 2011 Class Starter Decks. An innovative level-up system allows players to gain experience from attempting the Dungeon, defeating the Dungeon, defeating the individual bosses within the Dungeon, and fulfilling a host of specific achievements.